Joe presents Moritz Richter with his Bikes for Kids certificate. Marcus, Moritz’s father, and Allison Quast-Lents, owner of Motorless Motion, helped Moritz pick out his mountain bike. 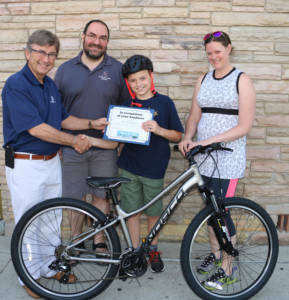 After competing in Field Day events at Donald L. Pavlik Middle School in Alma, Moritz Richter thought he would receive a paper certificate, or maybe a coupon for some free food, but he was pretty surprised when his teacher told him he won a mountain bike. 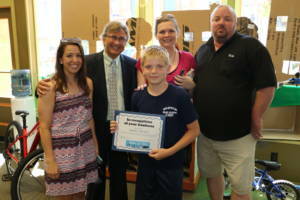 Richter, 12, did not win the bike for his skills on the field, but for his compassion in the classroom. 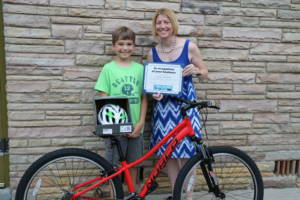 His teacher, Danette Guild-Hubbard, nominated him for Barberi Law’s Bikes for Kids program. The program recognizes children who are doing good things in their communities. “We wanted to do something to recognize those children in our community that quietly do things to help others,” Attorney Joseph Barberi said. Guild-Hubbard was Richter’s homeroom teacher, and she nominated him to win a mountain bike from Motorless Motion. In her nomination, she wrote about how Richter’s family is from Germany, though he was born in the United States, and how he is an English as a second language student. She said he did a variety of things to help her throughout the year, but one act of kindness really stood out to her. 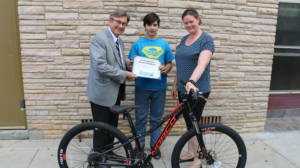 Richter and his parents, Marcus and Ellen, did not know that Guild-Hubbard nominated him for the Bikes for Kids program. After being contacted by Barberi Law, Marcus got in touch with Guild-Hubbard and asked her if she wanted to tell Mortiz the news. Richter and his parents came to downtown Mt. Pleasant Saturday, June 18, to pick out his new bike. Allison Quast-Lents, owner of Motorless Motion, helped Richter pick out his bike, helmet, and lock. She also showed him how to properly take care of his bike, and also told him some things to keep in mind while riding it. Richter was very excited to be recognized for helping others. He said he likes to help others because it makes them feel better. He also talked about the classmate he helps. Richter’s parents were happy to have their son appreciated for the kind things he does. They said he doesn’t look for recognition, but it’s always nice to be appreciated. Riley Jr., Crystal, Marley and Libby Olson stand with Libby’s new bike in front of Motorless Motion in downtown Mt. Pleasant. When Libby Olson was 7 years old, life as she knew it changed forever. She started to fear leaving the house, she would cry all day long, she was in constant pain. Her mom, Crystal Olson, said doctors didn’t believe there was anything really wrong with Libby. Finally, in October 2015, a doctor in New York diagnosed her with PANDAS, Pediatric Autoimmune Neuropsychiatric Disorders Associated with Streptococcal infections. This spring, Crystal saw a post about Barberi Law’s Bikes for Kids program on Facebook and decided to nominate Libby, 10, to win a bike. Libby, along with her mom, brother, sister, nana and papa, came to Motorless Motion in downtown Mt. Pleasant on Friday, June 24, to pick out her new mountain bike, helmet, and lock. She was chosen as the second winner in the Bikes for Kids program. Libby was really happy when she found out she won the bike for being kind and wanting to help others. One of Crystal’s friends who is homeless recently moved in with the family, which also includes an older sister and Libby’s dad, Riley. Libby gave up her room so their new guest would have a place to call her own. Crystal was really excited to learn Libby was chosen by Barberi Law to win the mountain bike. Crystal stays home full-time to care for Libby. Libby’s teachers from Ganiard Elementary in Mt. Pleasant came into their home to help keep her on track with her schoolwork. She will be in fifth grade in the fall at Fancher Elementary in Mt. Pleasant. Joe presents Joe Dawe with his Bikes for Kids certificate. Dawe’s parents, Heather and Daryl, and Allison Quast-Lents, owner of Motorless Motion, were there, too. On Friday afternoon, it was hard to tell who was more excited, the 10-year-old boy or his dad. They both walked into Motorless Motion in downtown Mt. Pleasant with huge smiles on their faces, as Joe Dawe, 10, of Ithaca, came to pick out his new mountain bike. Joe wasn’t getting a bike because he had outgrown his other one, but because he was being recognized for volunteering to help out a classmate. Joe’s dad, Daryl, had been trying to think of a way to reward his son for being kind. He said he saw a flyer for Barberi Law’s Bikes for Kids program and felt like it was the perfect way to recognize his son. Dawe coaches wrestling and was a little leery of the time it would take for Joe to walk this other boy to the car. He said after school is normally a time when he rushes around to get right to practice. Joe’s mom, two younger sisters and little brother all came to Mt. Pleasant to watch as he picked out his new gray bike, helmet and lock. Both his parents told him how proud they were. “Joe, just continue thinking with your heart and your mind, and it’s going to take you places,” his mom, Heather, said. Joe and Jaylin Bradbury stand with her new mountain bike outside Motorless Motion. Imagine going about your day, and all of a sudden, your hair starts to fall out in clumps. For Jaylin Bradbury, 8, of Shepherd, that is exactly what started happening to her last year. Jaylin was diagnosed with alopecia, a condition where the immune system attacks hair follicles, and doctors don’t know what is causing the hair loss. Since she was losing most of her hair, Jaylin decided to donate what hair she had left to a program that makes wigs for kids, since she now wears a wig. So, when her mom, Tina, saw a Bikes for Kids flyer in Jaylin’s Friday folder from school, she decided to nominate her. Tina submitted the nomination at the beginning of June, so when Barberi Law contacted her to tell her Jaylin had won in the last week of June, she was excited. “I had forgotten about it because I had nominated her a while ago, so I was surprised to get the call,” Tina said. Jaylin, her mom, her dad, Jason, her aunt and her mom’s fiancé came to Motorless Motion on Wednesday to pick up her new bike, helmet, and lock. Jaylin didn’t find out until that morning she was chosen to win the mountain bike. Jaylin said she was very happy to win and was excited to start practicing on her new bike in her long driveway. She said she chose to donate her hair because other people did it so she could have a wig. So, she wanted to help another child get a wig. “It makes them feel better,” Jaylin said. Tina said Jaylin hasn’t let her hair loss affect her too much. She participated in Girls on the Run this spring, as well as softball in Shepherd. Jaylin has been using steroid cream on her scalp for a year to try and stimulate the hair follicles and get her hair to start growing back in. Tina said the first cream wasn’t working, so doctors prescribed another one. If the creams don’t work, the next treatment would be injections into Jaylin’s scalp. Tina said they hope to avoid going that route. 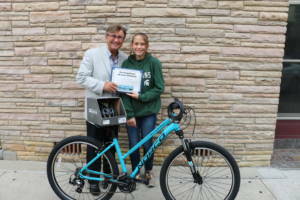 David Barberi presents Mitaya Collin with her Bikes for Kids certificate at Motorless Motion in downtown Mt. Pleasant. On Mitaya Collin’s 11th birthday, she celebrated with a new bike from Motorless Motion in downtown Mt. Pleasant. It wasn’t a gift her family bought, but a reward for being kind and always putting others first. 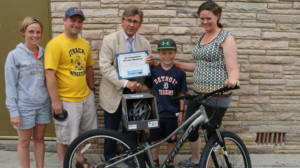 Collin was chosen as the fifth winner in Barberi Law’s Bikes for Kids program. Her grandma, Connie Napier, nominated Collin to win. Collin will be a sixth grader at Mary McGuire Elementary in Mt. Pleasant this fall. Her favorite subject is math, and she loves to spend time climbing trees in her yard and swinging with her friends. She enjoys helping others whenever she can. She said she thinks other kids will be inspired to be kind when they read about other kids, like her, being recognized for the good things they do. Her mom, Emma Stickney, said it was a bittersweet day for Collin. It was her first birthday without her dad, and she had already gone through his birthday and Father’s Day without him. Stickney was thankful Collin had something positive to take her mind off her loss for a little bit. Stickney said Collin was very excited to learn she had won a mountain bike. “She said, ‘I’ve got skills I didn’t even know I had,’” Stickney said. Napier said Collin loves little kids, especially her little brother and sister, and always helps take care of them. She said Collin is very sympathetic to others. “Even though she lost her daddy, she recently hugged me at my father’s funeral, and said, “’You’re OK Grandma, it’ll be all right,’” Napier said in her nomination. Easton Damude, 10, picked out his bike at Motorless Motion in downtown Mt. Pleasant. Three years ago, James Damude told his kids they needed to come up with some ideas on how to spend their summer vacation. He didn’t want them anchored in front of the television, or playing video games all day. So, the kids started making a list. Their idea, a lemonade stand, has grown into something bigger than they imagined. 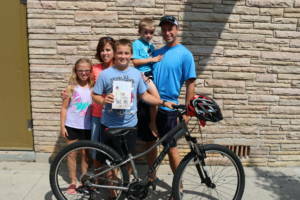 Easton Damude, 10, was nominated to win a bike through Barberi Law’s Bikes for Kids program for his work at the Midland lemonade stand, which raises money for foster kids to go to summer camp. Easton, his sister, Sydney, 8, his sister, Emily, 5, his brother, Silas, 3, and his dad came to Motorless Motion in downtown Mt. Pleasant Thursday to pick out his new bike. Damude said he studied business at Northwood University in Midland and wanted to teach his kids some of the basic principles. He said the lemonade stand has helped him do that. The family runs the stand, Sweet Sydney’s Old Barn Lemonade Stand, at the Midland Area Farmers Market and other events around the area. The kids are paid $5 an hour to work at the stand. They started out just serving lemonade, but now sell lemon drop candies and lemon-scented soap and candles. There is no set charge for cups of lemonade, it is all based on donations. They also ask local businesses to act as sponsors and put their logos and names on the back of T-shirts they sell. “It only works because of the generosity of the people,” Damude said. In 2015, the Damudes donated $3,000 to send foster kids to Mid-Michigan Royal Family Kids Camp this summer. Although the stand accepts any donation for a cup of lemonade, those that give $100 or more become “Lemonade Angels” and have an all-access pass to lemonade from the stand. Easton was excited about winning a mountain bike, helmet and lock from the Bikes for Kids program. His family didn’t know about the program, so they were surprised to hear Easton had won. Geoffrey Rettig, chief assistant prosecutor in Midland County, nominated Easton to win the bike. Easton is the paperboy in Rettig’s neighborhood, and Rettig thought a new bike could help Easton on his paper route. Rettig talked to Damude at a summer block party in their neighborhood and found out just how involved the family is in the community. Rettig felt Easton should be recognized for his professionalism and his work to give back to the community. Easton will be a fifth grader at Midland Academy. He and Sydney had a chance to speak to students at Northwood University in June about their lemonade stand. They spoke about social entrepreneurship at the weeklong camp, LAB (Learning About Business), and served the participants lemonade afterward. Xander Bardell, 11, of Mt. Pleasant, stands with the teacher who nominated him, Rachel Jaksa, attorney Joe Barberi, his mom, Dawn, and his dad, Mike, at Motorless Motion. When Fancher Elementary teacher Rachel Jaksa looked at a Bikes for Kids flyer she was supposed to distribute at school, she immediately thought of one deserving student. Jaksa, a fifth-grade teacher, nominated Xander Bardell, 11, of Mt. Pleasant, to win a mountain bike from Motorless Motion in Mt. Pleasant for the quiet things he does to help others. Bardell came to Motorless Motion to pick out his bike, helmet and lock on Tuesday, July 26, with his parents, Mike and Dawn, and Jaksa. His parents didn’t know Jaksa had nominated him to win a bike. Bardell said his parents initially teased him about getting a call from his teacher, making it sound like he was in trouble. Bardell said he enjoys helping others to keep them caught up on their schoolwork and make sure they know what they are doing. “I like the feeling of knowing they’re going to be able to do it,” he said. He will be a sixth grader at Fancher this year and has been attending the Youth Police Academy in Mt. Pleasant. The three-week program is for kids in fifth through seventh grades, and students have to write an essay and be selected for the program. “I want to be a police officer, or maybe a famous baseball player,” Bardell said. 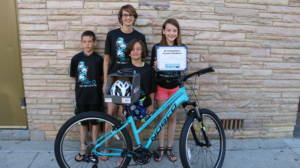 Jackson Beery, 11, and his family picked up his new mountain bike at Motorless Motion in downtown Mt. Pleasant. When Jackson Beery, 11, of Saginaw, was given a class assignment to create something that he could sell and give the proceeds to charity, he decided to write a book about his brother. Jackson’s book, “Differences Make No Difference,” was published and sold via lulu.com. The 30-page book features photos of Jackson and his 6-year-old brother, Chase. More than 300 copies have been sold, and Jackson raised $2,005 to send to Africa. Jackson’s dad, Matt, traveled to West Africa on a mission trip several years ago to help with construction of a church. Jackson chose to send his money there to help the missionaries. “So far, they have used the money to pay for medicine for two children with epilepsy, and the school fees for a first-grade girl who is an orphan,” Amber said. Jackson was excited to come to Motorless Motion on Wednesday, Aug. 3, to pick out his new bike, helmet, and lock. His parents, Chase, and his sister, Reese, came with him. Jackson didn’t know his mom nominated him for Bikes for Kids after seeing another one of the winners featured on WNEM-TV’s website. He talked about why he decided to write a book about Chase. “Kids with special needs are just as cool and awesome as other kids,” Jackson said. He said he was happy that he could create a project that raised money to help other people. “We’re all people, and God made us, and no one is better than others,” Jackson said. His parents are very proud of all he has accomplished, so far. “It’s really neat to see that compassion in him already at 11,” Amber said. Jackson will be a sixth-grader at Swan Valley Middle School in Saginaw this year. Carter Dole, 10, and his mom came to pick up his new mountain bike at Motorless Motion in downtown Mt. Pleasant. Carter Dole, 10, of Mt. Pleasant, has helped a special needs student at his school since they were both in first grade. But to Dole, it was just a way to make a new friend. 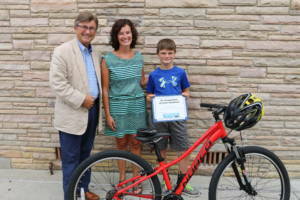 Dole was nominated by his fourth-grade teacher at Vowles Elementary, Laurie Richards, to win a bike through Barberi Law’s Bikes for Kids program. Dole and his mom, Jill, came to Motorless Motion on Thursday to pick out his new mountain bike, helmet, and lock. Dole was happy and surprised that Richards nominated him. “She’s always doing something different from everyone else, and it’s always fun,” he said about Richards’ classroom. Aside from making new friends, Dole talked about another reason he likes to help people. “Because if you don’t, they will just get bullied because they can’t do things others can,” he said. Jill also was surprised to find out Dole was nominated for the Bikes for Kids program, but she was happy her son’s teacher recognized him for his kind behavior. Dole will be a fifth-grader at Fancher Elementary in September. He has an older sister and a younger brother and was excited to win a bike for himself. “I will use it a lot, and I will have something Carly and Bennett don’t have,” he said. Chelsea White, 13, of Shepherd, picked up her mountain bike at Motorless Motion in Mt. Pleasant. As a Young Marine, Chelsea White, 13, of Shepherd, participates in many activities that teach her a variety of life skills. As part of her training over the past two years, she has enjoyed many community service opportunities. 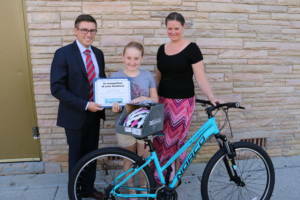 White, who will be an eighth-grader at Shepherd Middle School, was nominated to win a mountain bike from Barberi Law’s Bikes for Kids program by her Young Marines unit commander, John Smith. White was “overjoyed” when she found out she won a bike from Motorless Motion. She didn’t know Smith had nominated her. White, her mom, Krissy Giffin, and her sister, Jordyn, came to Motorless Motion to pick out her bike, helmet, and lock. White talked about why she likes helping others. “It gives me good satisfaction to know I’m helping people, to know I’m at least out there doing something,” she said. White said if she needed help, she wouldn’t expect someone to help her. But, she believes it’s good to be there for others and not expect anything in return. “Nobody really deserves to be left alone,” she said. White is a devoted artist, who loves the outdoors. She attends Young Marines every other Saturday throughout the year. She has visited the police station and jail in Mt. Pleasant, seen how the Jaws of Life works and taken part in an outdoor winter camping trip at Deerfield Nature Park, where she got to build her own shelter. Giffin said she was very proud of her daughter.